As 2018 rapidly approaches, the team at ComicBook.com came together to nominate our favorite creators and creations from 2017 in the worlds of comics, television, movies, and anime, recognizing the best of the best in each category. After condensing them to the five best nominees, we all voted on what we thought should be recognized in the top spot. Ensemble casts are hard to juggle on television; with so many different characters and plot lines to establish and develop, some are bound to get lost in the shuffle. But some superhero or comic-based shows manage to get it right, getting the perfect mix of talented actors with charisma and chemistry. Fan favorites like the time-traveling heroes from Legends of Tomorrow and the survivors Fear the Walking Dead have been party to many more great adventures this year, while newcomers like Marvel's Runaways and the Summerland crew of Legion have also stood out. With so many great options, we all had a tough time casting our vote. But only one could win. Marvel Television's first foray on Hulu's streaming service adapts the fan-favorite comic book by Brian K. Vaughan and Adrian Alphona. But while the Runaways' battle against their evil parents was fun and intriguing, most fans will tell you that the teen characters and their interactions were the true highlight of the comic. Hulu's adaptation nailed the dynamic, casting the roles of Gert, Molly, Nico, Karolina, Alex, and Chase perfectly. 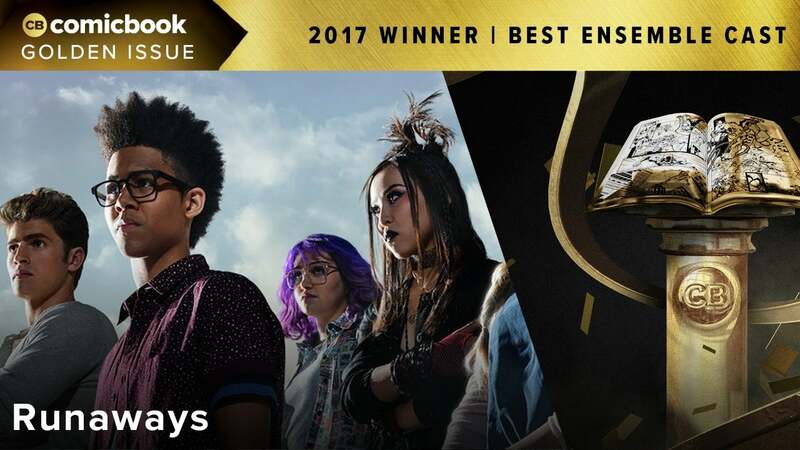 Rhenzy Feliz, Lyrica Okano, Virginia Gardner, Ariella Barer, Allegra Acosta, and Greg Sulkin appear as if they just leapt right off the page, and they excellently portray all of the quirks and traits fans will recognize. The series goes even further by fleshing out the parents of the PRIDE, who could warrant a show all their own. Watching as the PRIDE work behind each other's back, putting on fronts in public, and hiding secrets from their kids has made for intriguing television, taking the source material in an exciting direction while staying true to the characters. Runaways beat out some stiff competition. The cast of Legends of Tomorrow is also a riot to watch, and the many denizens of Gotham interacting always makes vfor great TV. The cast of Legion made for one of the most interesting new shows, and Fear the Walking Dead made major strides this year. We'll be announcing more winners throughout the week, so be sure to check back on ComicBook.com to see if your favorites won. And don't forget to tell us who and what your favorites were on Facebook and @ComicBookNOW on Twitter.